Property available only June,July and August. Our log home is 2,600 sq.ft. Situated on 35 acres approx. 8,200 ft in elevation. Surrounded by 1/2 million acres of National forest and BLM land. Views of Sangre deCristo and Collegiate mt ranges, along with the San Isabel Nationl Forest surround the home. Located 15 miles south of Canon City and 15 miles north of the 'quaint' town of Westcliffe, Colorado which is up against the Sangre de Cristo mountain range. Part of the beauty indeed in getting there is the drive up from Canon City on a steep, narrow hard packed dirt road. Or you can take the longer but also pretty route thru Westcliffe from Canon City. It is a private gated community. Enjoy hiking, biking, and fishing brown trout in Grape Creek only 3 miles down jeep trail or walk 3 miles down deer trail from front door. Visit the Royal Gorge a 50 minute drive away. Or raft the Arkansas river out of Canon City. We as homeowners want you to have the best possible experience at our rental. Please understand that you will be in the 'wild' and may have a chance to see wildlife. However, please be aware that wildlife such as cougars, bears, coyotes, need to be respected as the wild creatures they are so please do not feed them. Keep a respectful distance away from them (that is what zoom lens are for!) Cougars can be curious and we have seen them near the house in the past. So please take time to read the blue guest notebook on wild creatures upon arriving and take the proper caution. This is a remote area yet close to Westcliffe and Canon City and we hope you enjoy the many things the area has to offer! views, views, relaxing get away!! Remote and relaxing yet close to two towns with services 15 miles away! Canon City with all services and Westcliffe with grocery store and eating places up against Sangre deCristo mt. range!! toilet, combination tub/shower, jetted tub, 2 sinks and 2 vanities. toilet, shower, Part of bedroom 2 and off of the great room. toilet, combination tub/shower, Connected to bedroom 3. Off of the loft area. Bedroom 2 is a half bathroom! weber grill in garage please put back in garage when u leave! Monarch Ski area 90 min. away. There is bar/island with 2 stools in dining/kitchen great room area. Total eating could then be 8. Picnic table with 4 chairs in garage for deck area (table and chairs to be put back in garage when leaving on day trips and final departure due to high winds at times) *no fires inside or outside please due to dry area* Check- out time is 10a.m. and check- in time is after 4p.m. We had a great vacation! The house was exactly as described. The drive from Canon City was a little over 30 minutes and had breathtaking views. There wasn't cell reception, which was exactly what our family needed. Thank you for opening your home to us! Very nice house, with everything we needed. 4 of is were in Westcliffe for a horse show. The house was perfect for our 5 night stay. The interior was very nice, and the views and privacy were wonderful. Great time visiting the cabin. Awesome views. Enough space for the whole family with 3 full bathrooms to get us out in time for the days actiity. The drive to the cabin is about 30 minutes outside of downtown Canon City. Might seem far on the first drive, but gets quicker as you get familiar with the drive. However its not a drive for everyone, particularly drivers who aren’t comfortable on escalating dirt roads through the mountains. Lots of hiking close to the cabin. Short drive to Westcliffe and the very scenic San Luis Valley. Great grill and kitchen to prepare meals for a hungry family after a full days worth of activities. And finally lots of fun games for the kids and family to occupy those evening or rainy days. Highly recommend. Very clean and peaceful. The drive to the cabin is the only bad part about it. But it’s great once you get to the cabin. The Royal Gorge which we enjoyed whitewater rafting, helicopter tours, and the various other parks and shopping. We also went to Westcliffe, which is a smaller town for dinner and supplies. The only thing missing was AC in the home for night time sleeping. Over all we will rent again! 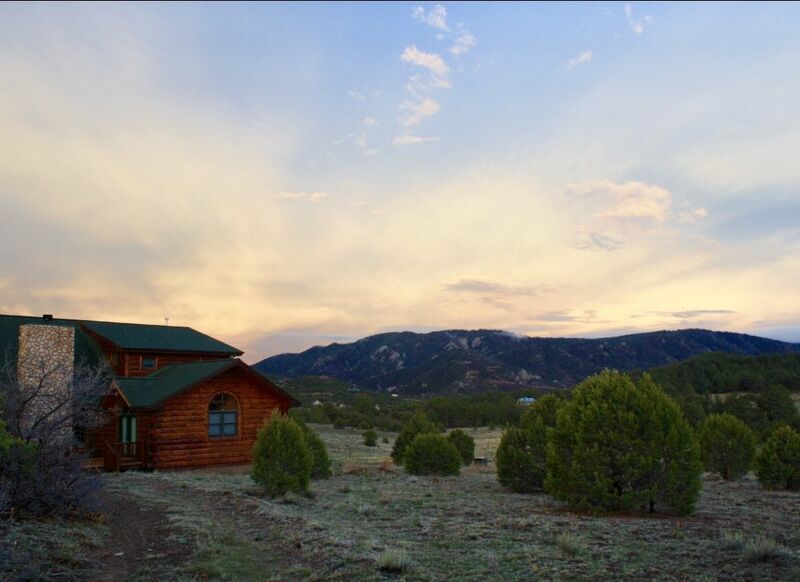 Log home is located on 35 acres 15 miles from the town of Canon City and 15 miles from Westcliffe with all the local services and businesses. It is off Oak Creek Grade rd which rises 3,000 feet up for 15 miles out of Canon city. It is a narrow, curvy, hard packed dirt road steep in spots, but very scenic.. Or you can take the longer 45 mile little less scenic but beautiful route thru Westcliffe. Colorado Royal Gorge and white water rafting are located approx. 50 minutes from the cabin out of Canon City. Golfing in Canon City 15 miles away. Skiing is 90 miles away at Monarch ski area. Hiking, biking, fishing (a three mile walk or drive away at Grape Creek) and rock climbing are all out the front door!! ATV rentals are available out of Westcliffe 15 miles away. We as homeowners want you to have the best experience possible at our rental. Please understand that you will be in the 'wild' and may have a chance to see wildlife, however, please be aware that wildlife such as cougars, bears, coyotes, need to be respected as the wild creatures they are so please do not feed them and keep a respectful distance away from them (that is what zoom lens are for!) Cougars can be curious and we have had them near the house in the past. Please take time to read the blue notebook at the cabin upon arriving about the wild creatures in the area and take the proper caution! This area is remote yet close to Westcliffe and Canon City so a variety of things can be experienced during your stay!!! Please pay by using e-check...if use charge card 2.5 % fee deducted from deposit. For property damage and cancellation protection, please sign up with VRBO CSA travel protection. Damage protection is a requirement. 4 night min. stay please. Check out time is 10:00 a.m. Check in time is 4:00 p.m.